Enjoy the comfortable pedal support and move in an environmentally conscient way. Models for men are equiped with a high middle rod. Models for women are equiped with a sporty trapeze frame and unisex models with a wave frame offer a very deep step-through. Bikes with diamond frame have a high top tube between saddle and handlebars and are thus often considered to be the classic bikes for men. The top tube is lowered for models with trapeze frame facilitating getting on. 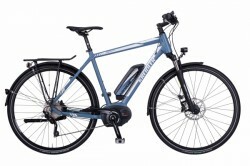 E-bikes with wave frames offers a very comfortable getting on, because there is not top tube between handlebars and saddle. The frame height is a decisive size indication for e-bikes. Rule of thumb is: leg length x 0.66 + - 2 cm. Filter the e-bikes according to the type of gear shift: e-bikes with hub gear or derailleur or ultra-modern pedelecs with infinitely variable automatic. 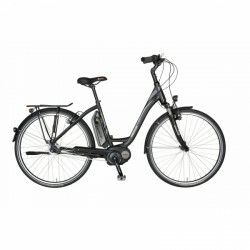 Choose between e-bikes with mid-engine or front engine. Mid-engines offer best cycling features. Front motors pull stronger, are more affordable, and are easier to transform. Choose here the tyre size of your e-bike. The tyre diameter is given in inches; 28 inches correspond to about 71 cm. According to the motto "Fast Forward", the German, medium-sized family and traditional company Kreidler has sold brand products for motor vehicles and bicycles since more than 100 years. Nowadays, Kreidler is an establish brand on the German bike market. The company philosophy of Kreidler is to offer customers up-to-date and high-quality products. This company philosophy is constantly realized with the current bike and e-bike collections and the developped e-bikees convince by design and innovative technology as well as by safety and quality. Kreidler e-bikes offer enormous variety for everyone. 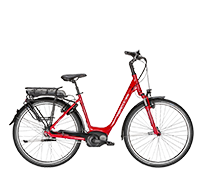 Either a pleasant shopping tour in town or a relaxed ride in the countryside: Kreidler offers the appropriate e-bike for every use. The Eco series convinces especially by visual highlights, high-quality components, and a powerful drive technology. Kreidler has also developped a very special model for a ride in the country or at the bike park. The e-mountain bike Vitality Dice 29er 2.0 (29er) also followed the mega trend of the electric motor and combines all criteria to meet the special requirements of the sporty and adventurous cyclist. The absolute eyecatcher of this model is the Bosch down tube battery. The innovative Bosch e-bike system of the Performance line ensures the required offroad power.